Have you ever experienced being loved unconditionally? Without reserve or embarrassment, from someone who doesn’t care about your weight, whether you have makeup on, if you’re having a bad hair day, or have issues, woundings or baggage? They don’t worry about whether you had a bad day at the office, had a argument with someone, or are hurting? In our society, as we grow up, we received many subtle and not so subtle messages about being bad, how we get the wrong answer sometimes, and we suffer many painful and embarrassing experiences all of which make us feel we’re unworthy of being loved. In self-defense, we learn to hide our hearts so we can fit in and conform so we can try to feel loved. This is a very hurtful pattern that often continues throughout our lives. Until we learn to face our demons and can make new decisions about our worth, value and ability to be loved. It can be hard to find a safe, non-threatening place to really feel love and let that in to help heal our hearts. 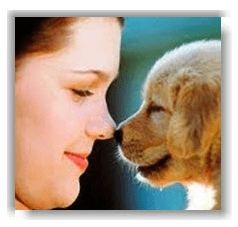 Fortunately for animal lovers, our animals are here to teach us about how it feels to be loved unconditionally. They demonstrate day after day what it means to care about someone without fear of rejection, to be in relationship with others without judgment, how it really feels to be embraced and loved with a whole heart, and offer the experience of being welcomed exactly as we are. They demonstrate day after day what it means to care about someone without fear of rejection, to be in relationship with others without judgment, how it really feels to be embraced and loved with a whole heart, and offer the experience of being welcomed exactly as we are. Who better to teach us about unconditional love than a puppy, kitten, or horse? I was recently speaking with an environmental engineer, a scientist and researcher dedicated to helping corporations reduce and eliminate their toxic emissions so they leave a smaller footprint on the planet. This handsome, grey haired gentleman was used to being logical, scientific, and didn’t show or share his emotions easily. But he started telling me about his dog, how she greeted him with exuberant joy every time he came home. He commented that his wife and children had never welcomed him like she did. And he had tears in his eyes as he reconnected with how it felt to be greeted with such love, acceptance, and a wide open joyful heart after a hard day at work. It lifted his cares and troubles, and helped him feel whole again. Our wonderful animal teachers and companions are in many ways our best friends, our partners, and are the ones who know us better than anyone else. They often choose to spend their lives with us helping us heal, loving us when we’re sick or sad… Helping us in every way they can, they share our life experiences, and continually demonstrate what unconditional love really means. Animals contribute to each of us and our planet in so many ways. The wild ones keep the circle of life strong, each one contributing in their way to everyone else. The native people knew that in order to stay healthy personally, and within their community, they must stay connected with the animals, treating them with respect and honor, listening and learning from them on many levels. Take a little time out each and every day to listen to and respect your animal teachers. Pay attention to what they are telling you. If they are ‘out of balance’, acting out in harmful or destructive ways, then notice where in your own life you may be out of balance or are incongruent within yourself. If they are offering their unique viewpoints, sharing love or joy or simply being themselves, then flow with them with gratitude and honesty. Open your heart and let their love and light shine into all the dark corners of your soul and spirit, body and mind. This is the gift that our animals give us every day if we let them, if we take time to connect with our hearts, feel our gratitude and appreciation that they are in our lives. We rediscover our connection with the planet and our own Divine nature when we reconnect with other beings – and doing that makes us better humans. 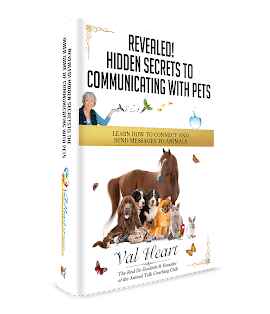 Do you have a powerful and urgent sense that YOUR pet needs to tell you something or is in need of healing? If you are serious about improving their animal’s health, behavior and understanding, if you’d like to experience breakthroughs you’d never expected, insights, healing, entertainment, enlightenment AND wisdom from your master teacher disguised as an animal, then now’s the time.